Prince Rogers Nelson died without a will. There were no legal documents found, no hastily scribbled notes or handwritten letters to indicate his final wishes. His well-known desire to control his image, his art, and his destiny can lead us to speculate what he might have wanted, but that’s not the way it’s shaking out. Today, there is a deathmatch in a Minneapolis courtroom to determine who benefits from his creative genius, and the corporate entities are stepping up to claim their share. Given his catalog, Prince’s Estate could be valued at $100 million to $300 million. An inventory and accounting of the estate’s assets listed a dozen properties in Minneapolis and its surrounding suburbs, companies with millions in liquid assets, and revealed that Prince invested in 67 10-ounce gold bars, worth about $840,000. After a battle to determine who controsl the estate, it is represented by entertainment lawyer L. Londell McMillan, and music industry veteran Charles A. Koppelamn. McMillan and Koppelman became the legal administrators of the Estate earlier this month after a contentious battle in a Minnesota State Court between the six likely heirs; Prince’s sister, Tyka Nelson, a half-brother and four step-siblings. Koppelman said he and McMillan are trying to balance Prince’s wishes against their legal obligation. Because he left no written will, the estate and its administrators have a legal obligation and responsibility to maximize return, regardless of what the artist may have wished. They are under pressure to act quickly for a variety of legal reasons, including an impending estate tax that could eat up nearly half the value. Tax on an estate is customarily due nine months after death, which in the case of Prince, is later this month. They are under a court mandate to get the most value from a catalog of about 1,000 songs including “Purple Rain’’ and “When Doves Cry.’’ The Estate is collaborating with the music industry’s most powerful corporations, including Universal Music Group and Warner Bros.
Prince’s music is expected to be available on streaming services in time for the Grammy Awards in February and his name and likeness will be showing up on merchandise in the near future. 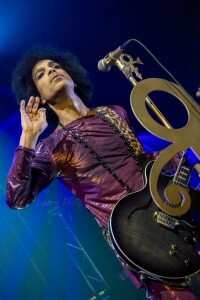 The Estate reached an agreement in October with Warner Bros., making the greatest hits package Prince 4Ever and the Deluxe Purple Rain reissue slated for this year possible, and entered into a deal in November making Universal Music Publishing Group the exclusive publishing administrator for Prince’s catalog.